Would you have imagined Instagram as an international marketing tool? Or have guessed just how popular Google+ has become? We can find fascinating insights into how and what people do in their everyday life through social media statistics. With the rise of inbound marketing techniques and an increase in business marketing, especially in the B2B world, these statistics not only reflect what people are doing during their personal time but also show how people are using social media to generate revenue. 1. B2B marketers use, on average, 6 different social networking platforms. The most popular are LinkedIn at 91%, Twitter at 85%, Facebook at 81% and YouTube at 73%. (Source: Content Marketing Institute) Tweet this stat! 2. Google+ averages 1.2 billion visits per month, while Facebook only averages 809 million. (Source: iMedia connection) Tweet this stat! 3. 40% of B2B buyers say LinkedIn is important when researching technologies and services to purchase; 19% say the same for Twitter. (Source: Social Media Today) Tweet this stat! 4. B2B marketers who use Twitter generate twice as many leads as those who don’t. (Source: Social Media Today) Tweet this stat! 5. 83% of B2B marketers invest in social media to increase brand exposure; 69% to increase web traffic; and 65% to gain market insights. (Source: Social Media Today) Tweet this stat! 6. 60% of social media engagement occurs through a mobile device. (Source: ADG Creative) Tweet this stat! 7. 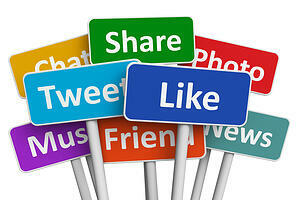 Social media has a 100% higher lead-to-close rate than outbound methods. (Source: ADG Creative) Tweet this stat! 8. Over 60% of Instagram users live outside of the United States. (Source: Social Strand Media) Tweet this stat! 9. 75% of the engagement on a Facebook post happens in the first 5 hours. (Source: Business2Community) Tweet this stat! 10. 45% of B2B marketers have gained a customer through LinkedIn. (Source: Social Media Today) Tweet this stat! Does this make you think about how you leverage social media platforms any differently? It should! Social media statistics are a great thing to take into consideration before embarking on a new social marketing campaign. You may be surprised at what you find.